New Dianara release right in time for Halloween! A basic D-Bus interface for ‘remote’ control, on systems which have D-Bus, of course. 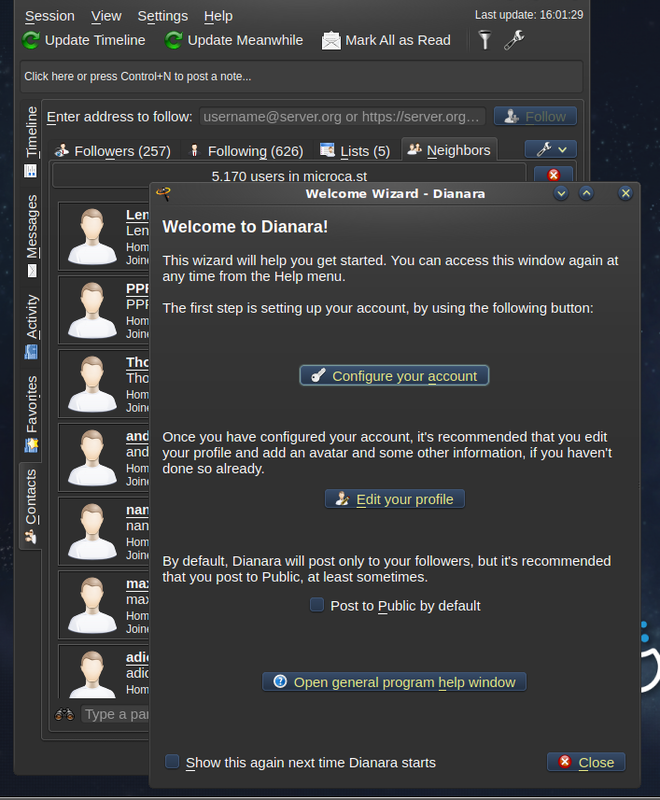 This interface allows the user to control Dianara to a certain degree (quite basic at the moment) from other programs, such as qdbus or dbus-send. There are two methods, ‘toggle’ and ‘post <title> <content>’. The former shows or hides the main window, and the latter creates a post, with the given title and content, ready to be completed and posted (this still requires manual intervention, for now). New privacy option, private likes. If you enable this, when liking a post or a comment from your timelines, only the author will see your ‘like’ activity in their minor feeds. It won’t appear in your followers feeds or in your public profile. You’ll still appear in the list of likes for that post though. Support for non-https servers. These are not common, but Dianara can be used with servers without SSL support, which use the http:// scheme, by adding the command line parameter –nohttps. A Hebrew translation has also been added, thanks to GreenLunar! Localization was improved in several areas. A new “Neighbors” tab, under Contacts, where you can get a list of the newest 50 users registered on your Pump.io server. You can follow them from there directly. However, due to the basic information the server provides for this, the users listed here will not have avatars or any bio info. You can still use the ‘User options’ button to browse their messages directly, or check their profiles in the web interface. But beware of spammers! A “welcome wizard”, with direct access to the first steps on using the program and the Pump network. This will appear every time you run the program until you uncheck the “show this again…” checkbox. You are currently browsing the Jan+KDE blog archives for October, 2015.